The Orca snorkel is a basic swim training accessory. It can be adjusted for a perfect fit so that you can focus on improving your technique, whilst breathing continuously under water. You can expel any water that might get into the tube whilst swimming through the blow valve. Improve your technique and performance in the water. not want to train respiratory muscles during swim exercise. The Twist Lock System Replacement is intended to replace the one that comes with the Powerbreather. It fits all models. Sold as a pair. The FLIP / WAVE caps slide on to the top of the Speedvents and snap into place. They are not needed to use the Powerbreather (PB) but aid in preventing water from entering the tubes in certain conditions. 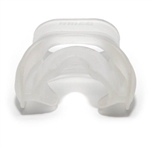 Mouthpiece made of soft, high-quality plastic and of identical size as the standard AMEO mouthpiece (black). Comes in Short size only. The Speed Vent Medium has a bit more resistance than the Speed Vent Easy, that now comes standard with all Powerbreather models. Comes in Short size only. The Speed Vent Power can add a hypoxic effect to your workout. Easily interchanged on any Powerbreather model. 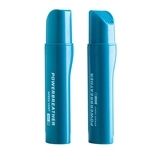 Unlike traditional snorkels, The Powerbreather allows you breathe in and out via two totally separate channels; breathe in new, oxygen-rich air when you inhale, breathe out CO2 from the bottom. The system also uses a membrane system to prevent water from getting in. Breathe as naturally as you would on land. Includes open water extensions. Unlike traditional snorkels, the Powerbreather allows you breathe in and out via two totally separate channels; breathe in new, oxygen-rich air when you inhale, breathe out CO2 from the bottom. The system also uses a membrane system to prevent water from getting in. Breathe as naturally as you would on land. Take your swim training to the next level with the TYR Ultralight Snorkel. By eliminating the head movements required for breathing, the swim snorkel allows you to focus solely on body alignment training. The Bullet Head Snorkel features a center mount system to help you maintain proper head position and body alignment as you train. Restricts breathing by 40%. Constructed of durable synthetic material for the Aqua Sphere Focus Swim Snorkel. The Aqua Lung Laguna is a submersible snorkel features a built-in bottom purge to clear excess water and keep tube clear. Ages 6+. 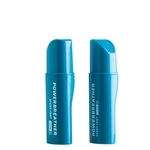 Reduces the chances of water entering the mouth or nose while swimming, creates a larger air pocket to allow you to breath more freely, and makes you feel the water/air interface which helps improve your freestyle swim technique. Goggle not included. The Michael Phelps Aqua Sphere Focus Swim Snorkel helps the swimmer focus on technique and body position without having to worry about breathing, it will also increase strength and lung capacity. The Arena Swim Snorkel allows swimmers to focus purely on stroke technique without the need to turn the head to breath. It permits a full range of motion, allowing the wearer to relax, maintaining proper body alignment, improve stroke efficiency & stability. Made for Children 4-9 Years, the Swimmers Snorkel Youth provides new and younger swimmers the ability to focus on stroke technique without breathing interruptions. The Swimmers Snorkel places greater emphasis on proper body alignment as it is specifically designed to allow athletes to relax in the water and maintain a completely laid out, horizontal position. Made for Children 8-12 years, the Swimmers Snorkel Jr provides new and younger swimmers the ability to focus on stroke technique without interruption. The snorkel allows kids to relax in the water and maintain proper body alignment and head position. The Freestyle Snorkel is designed specifically for freestyle swimmers so that they achieve a lower head position. The curved tube places the head and body in the proper alignment so that training can be optimized. Swimming with a snorkel allows the athlete to adjust his or her stroke to the maximum efficiency. The Snorkel Dry Top uses a patented design to keep the inner tube of the snorkel dry. An internal buoy rises when submerged to keep the snorkel dry, and falls when out of the water to allow for easy breathing. Fits on top of any FINIS snorkel (except the Youth Swimmers Snorkel) to restrict air flow for increased cardiovascular conditioning. The Atlantis LX Snorkel features Pivot Dry submersible technology that allows you to dive below water level, and an ergonomic silicone mouthpiece gives you comfortable wear, even during extended usage. 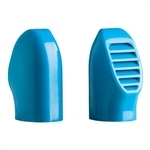 The snorkel restrictor caps restrict airflow by 70% and 40% in order to effectively increase swimmers� lung capacities. The two-piece set comes in bright yellow and orange, so you can easily differentiate between the caps. Train hard, train smart with the Ultralight Snorkel Airflow Restrictor Set! 2 restrictors included. The Snorkel Replacement Head Bracket fits the Swimmers Snorkel (Sr) and Freestyle Snorkel (Sr). The bracket uses a TPR padding that cushions the forehead and evenly distributes pressure. The Replacement Purge Valve is compatible with the Swimmer's Snorkels (Adult, Jr. and Youth). The silicone purge seat allows water to flow out of the snorkel without entering the mouthpiece. The Replacement Purge Valve is easily removed and the durable plastic is built to withstand chlorine damage.